Here the leaves are unfolding to show the developing flowers. 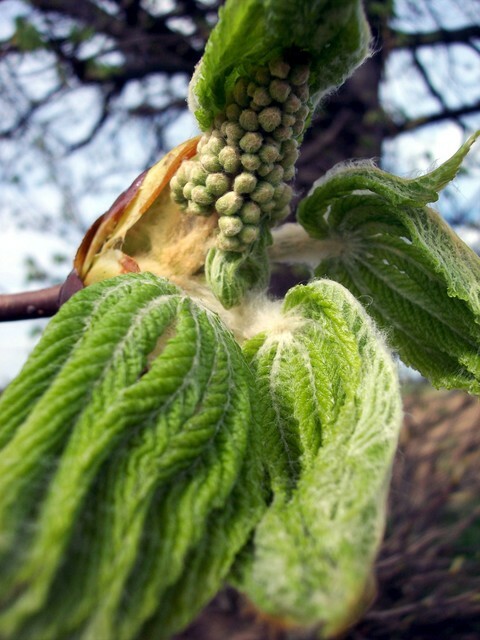 Horse-chestnut is a deciduous tree with dark grey-brown bark and palmate leaves (divided into 5-7 leaflets). It flowers May - June, each flower has four white petals. In late summer/early autumn it produces globular geen prickly fruits which then turn brown. Each fruit contains a glossy brown round seed. Picture taken 16th April 2006 near Old Warden, Bedfordshire.